Visiting Matjiesfontein is like stepping back into history. This little gem is hidden away just over two hours’ drive from Cape Town on the N1. Under the hill, or the “koppie”, as it is known in this part of the world, where tens of thousands of English soldiers were stationed during the Anglo Boer War, you will find a railway station, a couple of museums and the iconic Lord Milner Hotel.This town is situated in the Karoo, a semi-desert part of South Africa that has a special charm to it. It is an ideal destination for people who want to escape city life and breathe in some fresh air. There are many options for accommodation in this quaint little town, as well as inviting restaurants. A culinary experience not to be missed is The Hotel Dining Room at the Lord Milner Hotel, where guests are served by red-jacketed porters and may enjoy some local Karoo specialties by candlelight. Other activities include visiting the Marie Rawdon Museum, Transport Museum, old courthouse and jail, the British Army Remount Camp, and getting on board the red, double decker old English bus for a ten-minute trip through town. When one visits Matjiesfontein, you can expect to find more than just a little town with historic charm – expect to find magic. Located just over two hours from Cape Town on the N2, Akasha Mountain Retreat offers guests more than just relaxation. This gem is described as “an ideal off-grid location in which to disconnect from digital and reconnect with nature”. 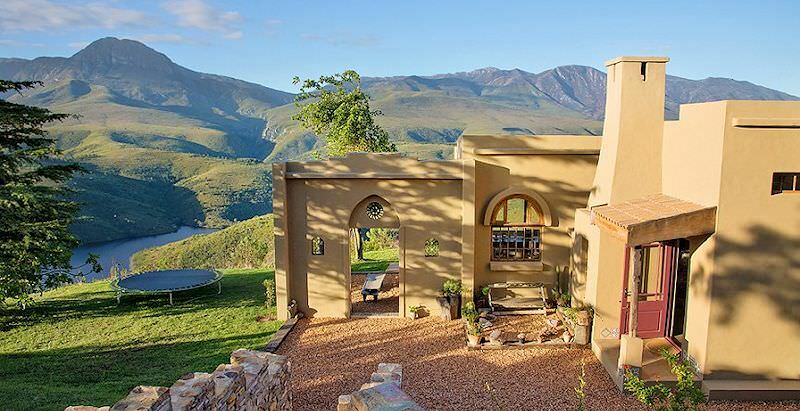 Akasha Mountain Retreat is a Cape Maroc-style house up in the Langeberg Mountains, which allow for spectacular views over mountaintops and rolling green hills, as well as the secluded Duiwenshoks Dam. This is the perfect place to sit back and relax with a drink in your hand, or to lie in the hammock reading a book. Of course, in an area this picturesque there are various activities to enjoy. Guests of Akasha Mountain Retreat can engage in activities such as hikes, horseback riding, mountain biking, fishing in the farm dam (ideal for the kids), stargazing, making some music and rbrm meditation. For those who are eager to get in touch with their creative side, there are beginners’ lessons in music, song writing, art as well as photography. Akasha Mountain Retreat is fully equipped for self-catering, but to ensure that guests have ample time to relax there is also a chef on hand. Thus, it is the ideal destination to escape the city life and marvel at South Africa’s natural beauty. The Owl House is definitely a one-of-a-kind treasure. You can find this magical place in the small Karoo town of Nieu-Bethesda, in the Eastern Cape province of South Africa. Helen Martins devoted her life to transforming her house into an artistic wonderland. In 1950, she started turning the house into a sea of glitter rainbows by using mirrors and glass. She did this by crushing glass bottles and then using the glass splinters as ‘wallpaper’. The backyard of her house is populated by the numerous concrete camels that she sculpted with the help of a few workers. She named it the Camel Yard, but over the years hundreds of other statues were also made and placed around this area. Most of these statues resemble figures that seem to be half human and half animal. This statue population grew into this quasi-religious dwelling. At the time of Helen Martins’ death in 1976, there were more than 500 of these masterpieces. She committed suicide by swallowing caustic soda. Today, the Owl House is a magical museum, which will make you feel like you might have stepped into a fairy tale. Visitors will enjoy the charming ambience skilled by the mind of a true artist. 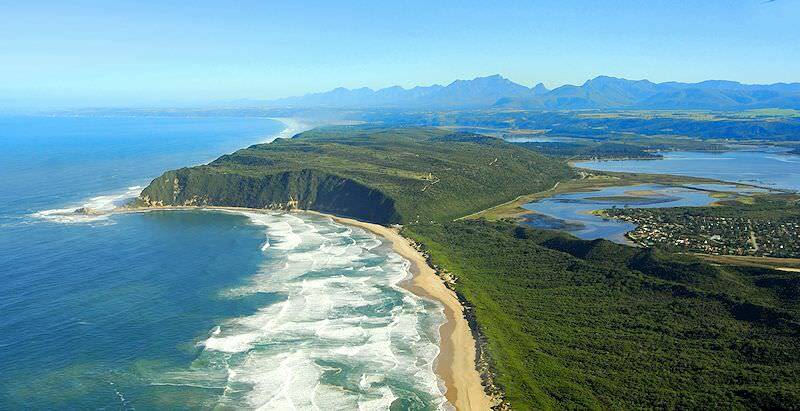 Sedgefield in the Western Cape is South Africa’s first official ‘slow town’. It is located in the heart of the Garden Route, one of South Africa’s most picturesque areas, surround by mountains, forests and the ocean. When visiting this town, one should not expect multi-story hotels or shiny shopping malls, but rather just natural beauty at its finest. For those who get a thrill from spending time outdoors, this is the ideal destination. From near unlimited hiking opportunities through forests or fynbos, to birdwatching or just taking long walks on the white beaches, there will never be a dull moment in Sedgefield. Bulungula is located along the rural Wild Coast of South Africa. In this little village, you will have a truly local experience. To reach Bulungula, you will need to embark on quite a journey, as its some way away from the highways, and you will need to drive over the seemingly never-ending, rolling hills on a dirt road. This trip is completely worth it, and part of the experience. This coastal retreat is situated on one of the world’s most beautiful beaches that is completely unspoilt by civilization, overlooking the Xhora River flowing into the Indian Ocean. The lodge is run by the locals, and forms part of a Xhosa village. Visitors have the option to reside in a Xhosa hut or in a safari tent, all of which have terrific views over the ocean and surrounding forests. Guests can enjoy traditional Xhosa meals at the restaurant and there is also an honesty bar. There are numerous activities every day, which allow guests to enjoy the landscape in different ways. These include horseback riding, canoeing, learning how the local women harvest and cook food, a Herbalist forest tour where you can walk through the forest with a traditional herbalist and learn about the traditional remedies, as well as a village tour, where you can learn about the social history of the village. Enjoy a splendid sunrise over the ocean or a mind-blowing sunset over the rolling hills and beaches. The most relaxing rural African experience is on offer at Bulungula. This treasure is hidden away in the Amatola Mountains, in the Eastern Cape province of South Africa. Surrounded by dense forests and countless waterfalls, guests are transported to a place which will make them believe in magic. Local legend has it that J.R.R. Tolkien spent time here while writing Lord of the Rings, inspiring him to create a fantasy world like no one could imagine. The town was named after the three peaks it overlooks, which resemble the hair on a hog’s back. Here you can get lost in the forest just to find yourself a million times over. There are several backpackers and B&B’s in the town, but they are outnumbered by the vast amount of hiking trails and waterfalls. It is the perfect place to go to escape the city buzz. Merely breathing in the fresh mountain air is a treat, but if you want to stay busy there are countless activities at your disposal. These include hiking, mountain biking, bird watching, mountain climbing and trout fishing. At the Away with the Fairies Backpackers, there is the ultimate spoil – an open-air bath that overlooks the lush green valley. You make your own fire to heat up the water and then you can sit back, relax, and cleanse your soul. Clarens is situated in the Free State province of South Africa. It is a quaint town that boasts a charming landscape. It lies at the foot of Mount Horeb, and is also surround by the Rooiberge and the Maluti Mountains. It does not take much imagination to realize that this town is simply beautiful. However, the surroundings are not the only beautiful thing to look at in Clarens. Ever since the early 90’s, Clarens has attracted many artists. Today, there is a route named the Artist’s Amble, which takes tourists past all the local art galleries that are run by and provided by local artists. For when you get tired of looking and want to start doing, there are various activities to keep you busy. Horseback riding, hiking, fly fishing, abseiling, rock climbing, white water rafting and golf are just a few of the popular endeavors to enjoy. All of these allow tourists to take in the magnificent view while taking time out to relax. There are also ancient caves to visit where you can admire San paintings dating back thousands of years. Clarens is a small but vibrant town. Over the weekends there are many restaurants that offer live music for those who favor charismatic ambience. Kaapsche Hoop is a delightful village situated in the Mpumalanga province in the northern part of South Africa. This town is surrounded by majestic mountains which, combined with the high rainfall of the area, creates a truly magical atmosphere. It is the ideal destination for a getaway, whether you are interested in good food, rewarding outdoor activities or merely just taking in the beautiful scenery. The town has several appealing restaurants with delicious food and old-fashioned décor. Just walking through the town on the gravel road under the lantern-lit streetlights will take you back a hundred years or so. The town is populated by wild horses who call this plateau their home. There are around 200 horses that are descended from horses that were sent here with the British troops stationed in this area during the Anglo-Boer War. These horses roam all around the town, even among the houses. The most popular activities around here also include horses, as there are various horseback riding trails around Kaapsche Hoop. Hiking is a very popular activity, as it is a great way to admire the beautiful scenery whilst walking off all the pancakes and delicious baked goods that you will not be able to resist in town. 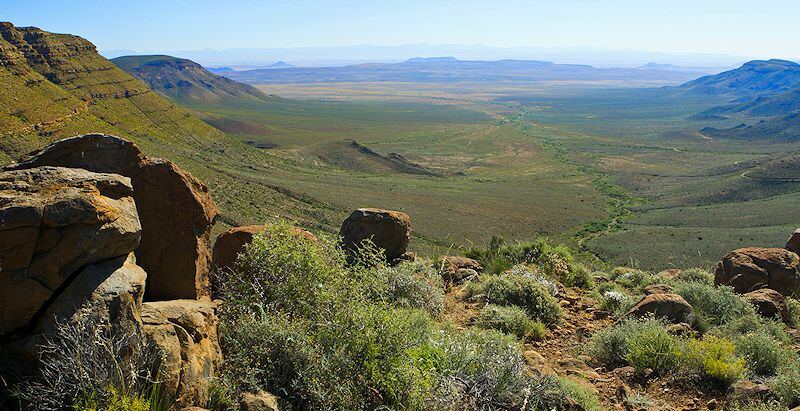 The Tankwa Karoo National Park is a unique conservation area in the Tankwa Karoo region of the Northern Cape province of South Africa. When visiting this arid treasure, you write your own story. There are no set hiking trails, restaurants or organized night drives. You decide which paths you want to follow, and when you wish to do so. It is easy to forget about all the activities that are readily available and just sit back, relax and enjoy the view. This view will consist of a beautifully blue sky, and right in front of you a whole lot of rocky, grassy nothingness. The park is any birder’s dream. Around 180 desert species call the Tankwa Karoo National Park their home, and many of them are endemic to the area. Some of the most prevalent birds found here are Burchell’s courser, the Karoo long-billed lark and Verreaux’s eagles. Other than birding, visitors to the Tankwa Karoo should also take a hike or a drive up the Gannaga Pass for a wonderful view or visit Middelpos – likely the smallest town in the country. Make sure to fit in enough game viewing and plant spotting, and treat yourself to some stargazing at night. The Amphitheater is located in the Northern Drakensberg region of South Africa. This earthly feature is arguably one of the most notable cliff faces found around the world today. To top it off, the Tugela Falls – the world’s second highest waterfall – flows down the amphitheater. This makes for unbelievable scenery. The hike up to the top of the amphitheater is relatively easy, but involves two chain ladders. The view from here is one of the most incredible on earth. An easy way to enjoy this natural phenomenon is to reside in the Amphitheater Backpackers. The backpackers has a direct view of the cliff face and the waterfall, constantly spoiling guests with natural beauty. There are also numerous activities to enjoy at the Amphitheater Backpackers, including rock climbing, abseiling, hiking up the mountain tops, visiting historical battlefields and even exploring Lesotho, the country within South Africa. When guests are done with the day’s activities, it is nice to just wander down to the river and enjoy and bird watching.